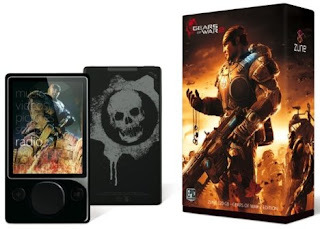 Recently Microsoft announce the Gears of War 2 Special Edition Zune player. The glossy black coloured 120 GB mp3 player will have the trademark Gears of War crimson omen etched on the back. In addition to the specialized graphic, the Gears of War 2 Zune will come preloaded with 244 media items that are related to Gears of War. This includes the game's original soundtrack, various videos, game art and more. Now The Source By Circuit City is offering Canadians the first opportunity to pre-order this cool item. According to The Source the estimated ship date is November 14th and it'll cost you $279.99.